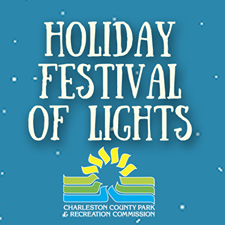 Featuring over 700 displays and two million lights, the Holiday Festival of Lights is a cherished holiday tradition for many families throughout Charleston and beyond. James Island County Park comes alive with illumination, and is a great place to capture the magic of the holiday season. The Holiday Festival of Lights has been recognized around the country and the world. It was featured as the only U.S. event in Moscow's Festival of Festivals, Coastal Living recognized it as "One of the Top 10 Holiday Celebrations," the American Bus Association ranked it as "One of the Top 100 Events in the Nation," and it was most recently named one of the "Top 20 Events in the Southeast" by the Southeast Tourism Society.